Today, Jack and Jill boasts over 240 chapters nationwide, representing over 40,000 family members. Each chapter plans annual programming activities guided under a national theme. Through service projects, Jack and Jill of America creates a medium of contact for children to stimulate their growth and development. 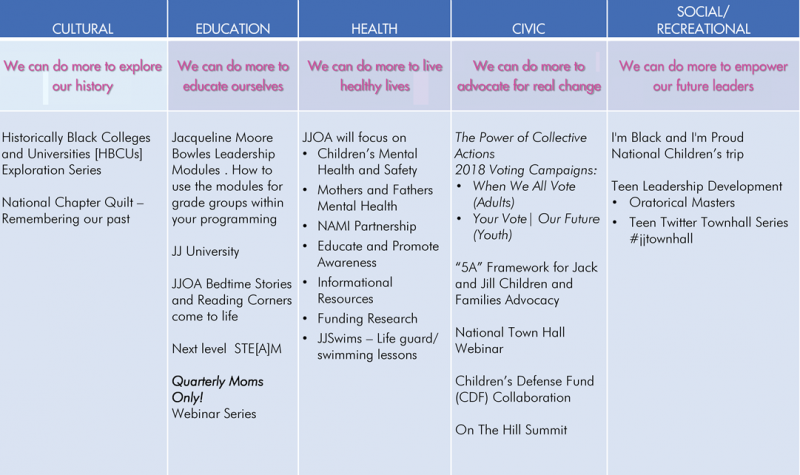 Teen Leadership Development: The Jacqueline Moore Bowles Leadership Module is comprised of 16 modules providing the necessary skills required to effectively lead in a constantly changing society.Volunteer Service: Annually, Jack and Jill members and their families log thousands of hours of volunteer service. Both members and children support and participate in efforts such as annual walks, marathons, beautification projects, youth mentoring and other initiatives focused on making a difference in the communities they serve. Financial Literacy: It is important that youth learn fiscal responsibility at an early age. Jack and Jill’s financial literacy modules offer youth ages 6-19 an opportunity to participate in mock stock market simulations, basic financial training and real world approaches in learning the principles of responsible money management first-hand. Civic Involvement: We represent over 40,000 family members, and over 10,000 members who serve their communities in over 35 states. We work in a variety of capacities to include stay at home mothers, teachers, lawyers, doctors, ministers and leaders of industry with the belief that we can make a difference in lives of children and families. We serve to make a change, actively engaging with our national and local partners. Since Jack and Jill of America, Inc. was founded in 1938 it has evolved into a strong national organization as a result of strong programming. 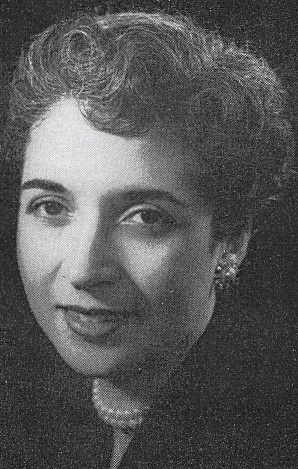 Our founder, Marion Stubbs Thomas had a simple idea of bringing together children in social and cultural relationships and this idea avalanched into a strong national organization. Our story of growth is one of amity and felicity. As new members were welcomed and new chapters are formed, the aims and ideals of Jack and Jill have strengthened, always with our children and civic service as the focal points.